That sounds so good to me right now! I am going to see if my sister is up for making some this weekend with me. 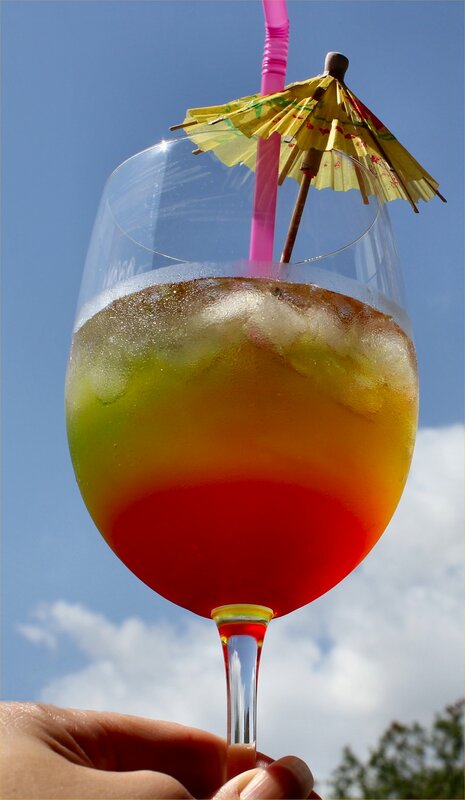 That’s the beauty of a tropical drink. You don’t need sunshine and warm sand to enjoy it. You just need a straw, a paper umbrella and the right combination of booze to get you there. Enjoy! Yah-mahn, de sisder whan ta know if you gonna serve dim next week’n? Yah, mahn, dah be good…..
What I wouldn’t do for a reason to slather on the Hawaiian Tropic right now. That is such a pretty drink! Once we thaw (again!) it will be time for our Friday Happy Hours in the neighborhood, a.k.a. Ladies Experimental Cocktail Night. (The guys drink beer–boring.) NanaBread’s Reggae Rainbow is sure to make an appearance when it’s my turn to host! As will the Mexican Margaritas. Hmmm…I think you are becoming a bad influence on me. Ooooo…I LOVE the idea of being a bad influence on you! Makes me feel so naughty. Your Ladies Experiental Cocktail Night sounds right up my alley, and your neighborhood sounds like a lot of fun. Best wishes for a quick thaw so you can get out and enjoy the neighbors (and cocktails) again! Supposed to be in the upper 20’s through the weekend, then warm up again. Thankfully, after our dumping of snow yesterday, it was sunny today so about 1/3 of it melted. Either way, the ladies are ready to reconvene our happy hours. It’s a family event, so one cocktail per customer, so your drink will be perfect. The thaw is like everyone coming out of hibernation.